sonic qualities of timbre and texture (which are sometimes termed the “color” of a musical sound). Noise is sound that is not wanted by the perceiver, because it is unpleasant, loud, or interferes with hearing. This results in the subjective discretion between sound and noise, where any sound may be considered noise depending on the perceiver. From a physics standpoint, noise is indistinguishable from sound as both are vibrations through a medium, like air or water. The difference arises from how the brain receives and perceives a sound. Noise music is a category of music that is characterised by the expressive use of noise within a musical context. This type of music tends to challenge the distinction that is made in conventional musical practices between musical and non-musical sound. Noise music includes a wide range of musical styles and sound-based creative practices that feature noise as a primary aspect. It can feature acoustically or electronically generated noise, and both traditional and unconventional musical instruments. It may incorporate live machine sounds, non-musical vocal techniques, physically manipulated audio media, processed sound recordings, field recording, computer-generated noise, stochastic process, and other randomly produced electronic signals such as distortion, feedback, static, hiss and hum. There may also be emphasis on high volume levels and lengthy, continuous pieces. More generally noise music may contain aspects such asimprovisation, extended technique, cacophony and indeterminacy, and in many instances conventional use of melody, harmony, rhythm and pulse is dispensed with. Luigi Russolo, a Futurist artist of the very early 20th century, was perhaps the first noise artist. His 1913 manifesto, L’Arte dei Rumori, translated as The Art of Noises, stated that the industrial revolution had given modern men a greater capacity to appreciate more complex sounds. Russolo found traditional melodic music confining and envisioned noise music as its future replacement. He designed and constructed a number of noise-generating devices called intonarumori and assembled a noiseorchestra to perform with them. Works entitled Risveglio di una città (Awakening of a City) and Convegno d’aeroplani e d’automobili (The Meeting of Aeroplanes and Automobiles) were both performed for the first time in 1914. In Hinduism, Jainism and Buddhism, a chakra (Sanskrit: Cakra, Pali : Cakka, Tamil: chakra ) is thought to be an energy point or node in the subtle body. Chakras are believed to be part of the subtle body, not the physical body, and as such, are the meeting points of the subtle (non-physical) energy channels called nadi. Nadi are believed to be channels in the subtle body through which the life force (prana) (non-physical) or vital energy (non-physical) moves. Various scriptural texts and teachings present a different number of chakras. It’s believed that there are many chakras in the subtle human body, according to the tantric texts, but there are seven chakras that are considered to be the most important ones. Synesthesia is a rare neurological condition that leads stimulation in one sensory pathway to trigger an experience in another. Basically, a short-circuiting in the brain that enables such strange phenomena like perceiving letters and numbers as inherently colored (color-graphemic synesthesia) or hearing sounds in response to visual motion. More than 60 types of synesthesia have been identified, with one of the most common being the cross-sensory experience of color and sound — “hearing” color or “seeing” music. In auditory-visual synaesthesia, all kinds of sound can induce additional visual experiences. To identify the brain regions mainly involved in this form of synaesthesia, functional magnetic resonance imaging (fMRI) has been used during non-linguistic sound perception (chords and pure tones) in synaesthetes and non-synaesthetes. Synaesthetes showed increased activation in the left inferior parietal cortex (IPC), an area involved in multimodal integration, feature binding and attention guidance. No significant group-differences could be detected in area V4, which is known to be related to colour vision and form processing. The results support the idea of the parietal cortex acting as sensory nexus area in auditory-visual synaesthesia, and as a common neural correlate for different types of synaesthesia. Fig. 1. Significant brain activation differences on the whole-brain level revealed by the multi-factorial ANOVA with the factors “group” and “stimulation” ( p FWE < 0.05, extent threshold > 10 voxels). (A) Effect of the main between factor “group” ( T -Test): one cluster is significantly more activated during auditory stimulation in synaesthetes in the left inferior parietal cortex (IPC). MNI-coordinates of the centre of mass of this cluster: x = − 46, y = − 54, z = 58. (B) Effect of the main within factor “stimulation” ( F -Test): in both subject groups differences between stimulation conditions revealed two significant clusters in left and right temporal cortex. MNI-coordinates of the centre of mass of these clusters are: x = − 50, y = − 24, z = − 2/ x = 58, y = − 16, z = − 4. p = posterior, a = anterior, r = right, l = left, colour bars show strength of activation. Fig. 2. Acoustically induced synaesthetic photisms: the photisms induced by (A) a piano tone in A’ and (B) a major piano chord in A’ painted by the same three synaesthetes are shown exemplarily. Arrows indicate the direction of movement of the photism. Sound and light share the fundamental nature of vibration. 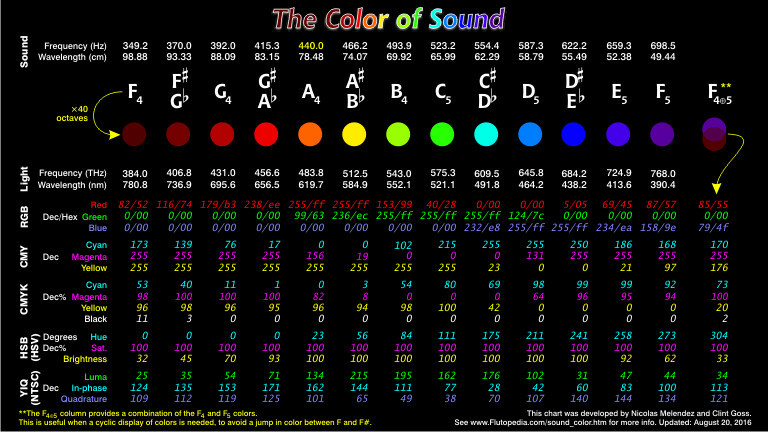 And, even though the sounds we can hear have a much lower frequency than light that is visible to us, there is a range of sound frequencies that have corresponding consonant colors. This page delves into consonant relationships between sound and color and and provides a tool to let you explore their relationship. However, before diving too far down this particular rabbit hole topic, please realize that the vibrations of sound and light are very different. Sound is based on vibrations of air molecules as a moving compression wave. Light (and hence color) is based on an electromagnetic wave. While “frequency” is a measure commonly used for both compression and electromagnetic waves, the two types of waves have substantial differences. Despite these challenges, the Sound⇔Color link has been reported to be potentially useful in many contexts including the treatment of synethesia, music education, meditation practices, and therapeutic music making. What apsect of sound are we dealing with? The vowel that is used by people who are doing vocal toning. Some vowels are “URRR…”, “AHH…”, and “EEE…”. The fundamental (lowest) frequency component of the sound. This is often translated into pitch based on some pitch standard and tuning system (typically a pitch standard of A=440 or A=432 and a tuning system of 12-TET or some just-intoned tuning system). A musical interval such as a minor third or a perfect fifth. How are the colors being represented or specified? Ways of representing colors abound. The various systems, called color models, are often related to the practical aspects of displaying colors on display screens or printers. These systems often have multiple components, such as the Red-Green-Blue systems used in Cathode Ray Tube displays. Another method for specifying colors is to use the visble colors we can see in the electromagnetic spectrum — the colors of light that we see in a rainbow. In this system, it is typical to give a single number — the frequency of the electromagnetic radiation — when specifying the color. Note that not all colors can be represented in every system. Some colors produced by a computer screen do not appear in the visible light spectrum. ❏ Conversations with Spaces | Exploring how audiovisual technology can be used to transform, create, expand, amplify and interpret physical spaces. I have been interested in translating elements of speech into different mediums and contain/capture them in a physical space. The aim has been to open up the subject of the visualisation of speech to a wider audience through the communication of the shape, movement and rhythm of language to visually represent the difference in speech patterns. It consisted of two different installations, both engaging with sound’s impact in multiple ways, so that people could both feel and create music, by hearing, touching and seeing the sound.